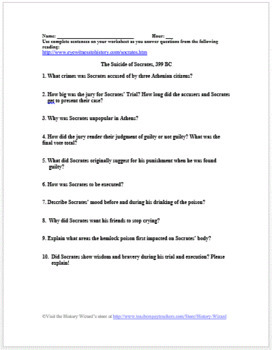 This worksheet allows students to use a primary source document to learn about the trial and suicide of Socrates. 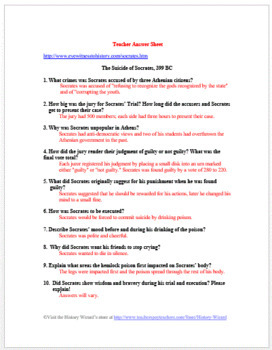 I use the worksheet to help students better understand Socrates and the legal system of Athens. Students read the document and answer the questions on the worksheet. 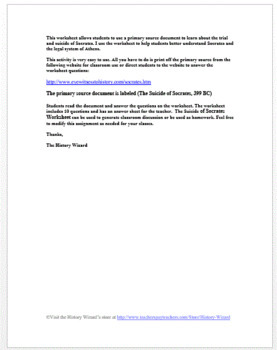 The worksheet includes 10 questions and has an answer sheet for the teacher. 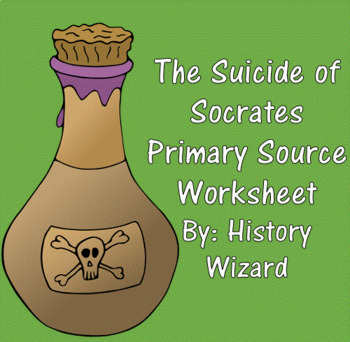 The Suicide of Socrates Worksheet can be used to generate classroom discussion or be used as homework. Feel free to modify this assignment as needed for your classes. Please check out my other Ancient Greek, Roman, and Byzantine lesson plans! Please check out the following Ancient Civilization Lesson Plan Collections so you can get great discounts if you are buying more than one lesson plan! Visit my Facebook Page and "like me" to receive updates and free lesson plans.